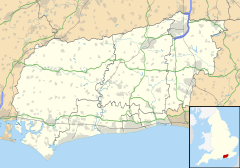 Barns Green is a village in the Horsham district of West Sussex, England. It lies on the Billingshurst to Itchingfield road 2 1⁄2 miles (4.0 km) north of Billingshurst. It is noted for the annual half marathon  race of the same name, held around the end of September. This page was last edited on 24 February 2018, at 13:53 (UTC).